Buildings should not only be functional but aesthetically pleasing. This requires the use of decorative materials both on the exterior and inside a building. Building decorative materials reviews the range of materials available and their potential applications. The book begins by considering the main types of decorative material and the physical, mechanical and other properties they require. It then discusses types and potential uses of decorative stone materials such as marble, granite, slate or gypsum. It then goes on to discuss the ways cement and concrete can be used for decorative effect, before considering the role of ceramics in such areas as tiling. 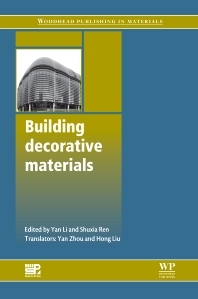 The following chapters review decorative glass for windows or facades, metals and wood before assessing polymer materials such as plastics and textiles. The final group of chapters discuss coatings, including waterproofing materials, multi-functional materials used for such purposes as soundproofing and thermal insulation, and the use of more sustainable decorative materials. Building decorative materials is a useful reference for architects, civil engineers and those studying civil or structural engineering. Dr Y. Li is a Professor at The Institute of Textiles and Clothing at The Hong Kong Polytechnic University, Hong Kong. He is a Fellow of The Textile Institute, a member of several professional bodies and has more than 350 scientific publications and patents. Shuxia Ren coordinates a team of authors who are leading experts involved in teaching the national building decorative materials course in China.